The family’s main business is still grain-trading and the sandwiches are a sideline, but what a sideline! If you think you can’t face Old Delhi in the summer, try the Jain Coffee House – park yourself next to a sack of wheat and tuck in. Jain Coffee House, open 10am till 8pm. From Chawri Bazar Metro walk along Chawri Bazar until almost at the left turn into Nai Sarak. On your left is a small gully, Raghu Ganj – walk in and turn left, Jain Coffee House is the grain store at the far left. been here few times and i agree completely with your review…. he also make a decent cold coffee…. I find his mango sandwiches very scrumptious. Mmmmm mouth is watering. I read bout this place sometime ago as well..Was a similar reaction from the writer. You are doing a yeoman service to Old Delhi street food. Great work, keep up ! Abhishek – Happy eating in Old Delhi – although it’s so damn hot at the moment even I’m thinking twice! 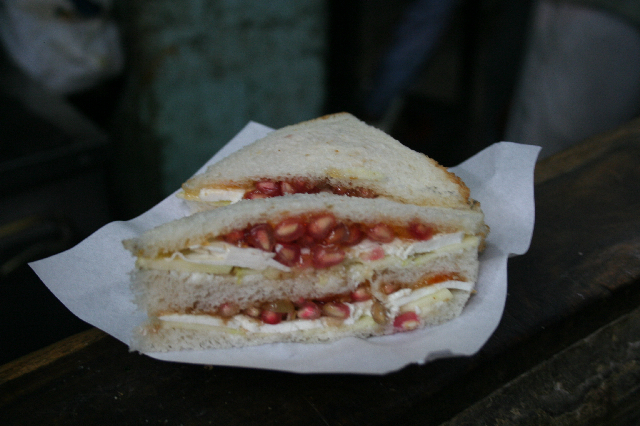 Deepak – thanks for reminding me about Novelty – I still haven’t blogged about that place and their sandwiches are amazing! Looks and sounds rather interesting! Guess won’t make fun of my hubby next time he suggests making mango sanwiches on the griddle with ghee as the choice of fat , done on low heat till the sandwich is really crispy on the outside. His granny used to make it for him as a treat! Natasha – I definitely approve of Granny! I will be your personally obliged if i’m notified as & when a new post is pasted on the website.